South Beach Smoke Father’s Day Sale! 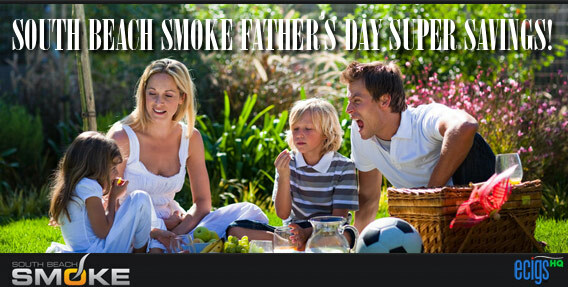 Posted by Admin on Jun 4, 2013 in e-Cigarette Special Offers | Comments Off on South Beach Smoke Father’s Day Sale! 25% OFF All Starter Kits! 20% OFF All Cartridges! That’s right, it’s that time again! South Beach Smoke appreciates loyal customers and loves to help you save on e-cigs. Shop now and get 25% OFF on all Starter Kits and 20% OFF on all 15-packs of cartridges! You may be running low on your cartridges or maybe you’d just like to switch it up and try a new flavor. If you usually keep it classic with Tobacco, take a risk and try out our very popular and must-have Peach flavor. Feel like the taste of a drink, but don’t want that nasty hangover — perk up with happenin’ Piña Colada! Can’t decide on a flavor? Then don’t and try the variety pack that offers all of the flavors at your fingertips. Whatever you decide, decide to SAVE now on all 15-packs of cartridges! Also — don’t forget to honor your Father that insists on smoking and get him started on the right track! For a limited time only, enjoy 25% off starter kits! Buy now, time is ticking! Enjoy the Savings with 20% OFF Cartridges! Tobacco Blue: The perfect blend for a smooth and refined tobacco taste. Tobacco Gold: Perfectly blended for that rich turkish flavor! Menthol: Enjoy a blast of cool and refreshing menthol. Chocolate: Satisfy your urge with a pure chocolate taste! Vanilla: Satisfy your sweet tooth with The pure taste of vanilla. Peach: For those who love peaches. Fruity, sweet and satisfying. Cherry: Everyone love the luscious, sweet and irresistible flavor of cherry. Piña Colada: Rich and creamy! Like a day at the beach! Peppermint: Sweet, cool and smooth! feel refreshed with peppermint! Variety 10 Flavors: Can’t decide? Try a variety pack of our original flavors! To take advantage of the Father’s Day Sale today, visit the South Beach Smoke website by clicking either the banner above or the link below. No coupon code is required as discounts are automatically applied at checkout. But you’ll need to hurry as this sale ends June 11th, 2013. Click now to take advantage of this special offer! Don’t miss out! Click here to check out the best e-cigarette offers available anywhere. SmokeTip Free E-cig Starter Kit Sale! Posted by Admin on Jun 4, 2013 in e-Cigarette Special Offers, Free E-cigarettes | Comments Off on SmokeTip Free E-cig Starter Kit Sale! Add 10 or more 10 packs of cartridges per order to your cart. Add a starter kit with your choice of cartridge strength and flavor to your cart. Use the coupon code 10CART4KIT at checkout. The $59.95 starter kit price will be deducted from your final total. Important: you must add the kit to your cart and use the coupon code at checkout to take advantage of this offer. Don’t miss out on this unprecedented offer. Click the photo above or the link below to get your free starter kit today. Click here to take advantage of this unprecedented offer! OFFER SUBJECT TO CHANGE/WITHDRAWAL AT ANY TIME WITHOUT PRIOR NOTICE. White Cloud 20% Off Starter Kits Sale! Posted by Admin on May 30, 2013 in e-Cigarette Special Offers | Comments Off on White Cloud 20% Off Starter Kits Sale! LIMITED TIME OFFER MAY BE WITHDRAWN AT ANY TIME WITHOUT PRIOR NOTICE. Now you can stock up on White Cloud Starter Kits at an amazing 20% off. For a limited time all Starter Kits have been reduced a whopping 20%. Are your White Cloud batteries getting old and in need of replacement? Now is a great time to replace them or add to your collection. Save 20% on your next purchase of Cirrus 3, Cirrus 3X, Variety and Phantom Kits! No matter which kit you select — you SAVE BIG! Looking for a compact e cigarette kit to take out on the town? 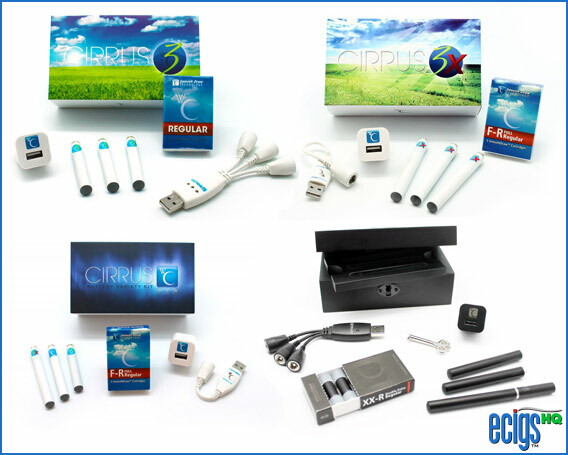 Try the Cirrus 3 starter kit. Spend the entire day soaking in the great outdoors with White Cloud’s longest-lasting e-cig battery yet. If variety is the spice of life, then allow White Cloud to sizzle your senses with a serious combo kit. When you need a discreet smoke, go incognito with the stealth-vaping power of the White Cloud Phantom. We have and would pay more for White Cloud‘s unparalleled quality, safety testing, and industry-leading research and development — but we are certainly happy to pay less than what second-rate economy brands charge. To take advantage of this special limited-time offer, click the banner above or the red text link below. Sale pricing has already been built into the shopping cart, so no coupon code is necessary. But you will need to act quickly, as this sale will end without prior notice. Click here now to take advantage of 20% savings! Breathe Fresh Free E-cig Starter Kit Memorial Day Sale! Posted by Admin on May 25, 2013 in e-Cigarette Special Offers, Free E-cigarettes | Comments Off on Breathe Fresh Free E-cig Starter Kit Memorial Day Sale! Get a FREE Basic Starter Kit For Memorial Day! Act Now to Receive a FREE Breath Fresh E-cig Version 2.0 Starter Kit + 10% Off! Now through Monday receive a FREE Basic Starter Kit with every order of 10 or more version 2.0 refills! No Coupon Necessary. Offer is good only while supplies last. Your Basic Starter Kit will automatically be added to your cart upon adding the 10 cartridges to your order. Note that Breathe Fresh will send you a new battery with every refill order of 5 or more so you will NEVER have battery issues again! Use coupon code “memorialsale” to receive an additional 10% off through Monday, May 27th. Breathe Fresh Batteries are GUARANTEED FOR LIFE! But it gets better! You’ll receive a FREE Battery with all orders of five (5) or more refill cartridge packs. No coupon code required. That’s an unbeatable deal! Click to get your Free E-cigarette Starter Kit! V2 Cigs Memorial Day Coupon Code Sale! Posted by Admin on May 24, 2013 in e-Cigarette Special Offers | Comments Off on V2 Cigs Memorial Day Coupon Code Sale! Offer good 5/27/13 and 5/28/13 ONLY. V2 Cigs — It’s the V2 Memorial Day Triple Play! Celebrate Memorial Day with BIG Coupon Code Savings at V2Cigs.com for 2 Days Only! You loved it, so they brought it back! This Memorial Day, multiply your savings with the V2 Memorial Day Triple Play. Use coupon code “Save35” when you spend $200 or more and get 35% off the cost of your entire order. Coupon code “Save30” gets you 30% off orders totaling $150. Use “Save25” to get 25% off orders of $100 or more. Sale is May 27th thru May 28th ONLY. Use the coupon codes at checkout to enjoy the holiday savings. Save Big when You Stock Up! With the V2 Memorial Day Triple Play, your savings are up to you! Just fill your shopping cart with your V2 favorites and apply the corresponding coupon code. For example, you can pick up the V2 Standard Plus Kit and an 80-pack of your favorite carts — normally priced at $219.90. Use coupon code “Save35” and it’s yours during the sale for only $142.93. That’s a savings of nearly $80! For the Ladies — Vapor Couture — Your Savings are up to You! It’s the Vapor Couture Three Ways to Save Memorial Day Sale! This Memorial Day, decide how much you want to save with the Vapor Couture Three Ways to Save Memorial Day Sale. Use coupon code “VCSave35” when you spend $200 or more and get 35% off the cost of your entire order. Coupon code “VCSave30” gets you 30% off orders totaling $150. Use “VCSave25” to get 25% off orders of $100 or more. Sale is May 27th thru May 28th ONLY. Use the coupon codes at checkout to enjoy the holiday savings. Save up to 35% on V2 and Vapor Couture Starter Kits! Save up to 35% on V2 and Vapor Couture Cartridges! Save up to 35% on V2 and Vapor Couture Batteries! Save up to 35% on V2 and Vapor Couture Accessories! Click the banner above or use the red text link below and enter the appropriate coupon codes at checkout to enjoy the savings. *CERTAIN EXCLUSIONS APPLY. OFFER SUBJECT TO CHANGE/WITHDRAWAL AT ANY TIME WITHOUT PRIOR NOTICE. Apollo Weekend 25% Coupon Code Sale! Posted by Admin on May 24, 2013 in e-Cigarette Special Offers | Comments Off on Apollo Weekend 25% Coupon Code Sale! Offer good thru 5-27-13 only. Apollo Electronic Cigarettes — our #1 ranked brand — is offering an incredible 25% off sitewide this weekend only with the coupon code in the banner above. All are on sale this weekend only. Free shipping is included for U.S. customers on orders totalling more than $30.00. Don’t miss out on Apollo’s best sale of 2013. The savings end at midnight on Memorial Day, May 27th. Ecigs HQ wants you to know that there is nothing second rate about the Apollo brand of electronic cigarettes. In fact, we rate Apollo as the best electronic cigarette of 2013. To get your 25% discount, simply click the banner at the top of this post, or click the red text link below and use coupon code “WEEKEND”. But you’ll need to hurry as the sale ends on Monday, 5/27/13 at midnight. Click Now for 25% Savings on Apollo E-cigs! Green Smoke Memorial Day Coupon Code Sale! Posted by Admin on May 23, 2013 in e-Cigarette Coupon Codes, e-Cigarette Special Offers | Comments Off on Green Smoke Memorial Day Coupon Code Sale! Celebrate Memorial Day with Coupon Code Savings at GreenSmoke.com! 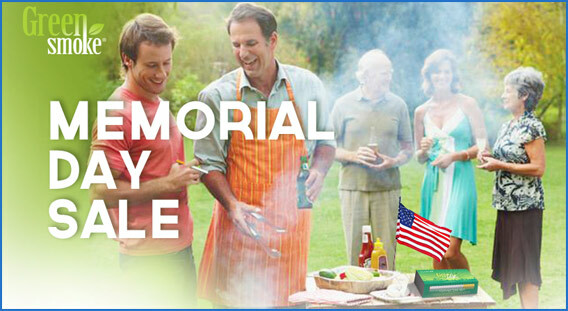 Break out the barbecue and the cold refreshments, Green Smoke is holding a Memorial Day Salute to Our Heroes Sale! Enjoy real savings on a real smoking sensation! Use coupon code MDAY2013 to save big (up to 20%) on Green Smoke’s complete line of Starter Kits, your favorite FlavorMax™ Cartomizers, Designer Batteries, Adapters, Chargers, Cases and more. Save $20 on Memorial Day Pro Kit! Save up to 15% on cartomizers! Save up to 15% on batteries! Save up to 15% on accessories! New to Green Smoke and unsure about buying a Starter Kit? If so, we have a deal for you! Now thru May 27th, you can pick up a Green Smoke Memorial Day Pro Kit for the unheard of low price of only $80.06! Click the banner above or use the red text link below and coupon code MDAY2013 at checkout to enjoy the savings. White Cloud e-Cigarettes Introduces the Fling Mini! Posted by Admin on May 22, 2013 in e-Cigarette Coupon Codes, e-Cigarette Special Offers | Comments Off on White Cloud e-Cigarettes Introduces the Fling Mini! New disposable electronic cigarettes is the same size as a traditional tobacco cigarette. Introducing the New Fling Mini! White Cloud‘s latest innovation has finally arrived! Fling Minis utilize the same technology as their full-sized cousins, but in a package as small and light as a traditional cigarette. The new Fling Mini disposable electronic cigarette produces approximately 150 rich, full-flavored puffs of vapor in one conveniently sized package. There’s no charging necessary; simply enjoy and replace when it stops producing vapor. The smaller design makes it easier than ever to carry your e cig with you and enjoy it virtually anywhere while the exclusive soft tip makes it feel even more like a real cigarette between your fingers and on your lips. Satisfy even your strongest nicotine cravings without any of the negative aspects of tobacco cigarettes and save thousands of dollars over the course of a year with the new Fling Mini disposable e-cigarette. Choose your favorite flavors and experience the White Cloud difference today. Fling A Friend prices on 10 packs of Flings makes it easy to share a Fling with a friend! It’s a great way to introduce them to E cigarettes, and all the original flavors of White Cloud! Perhaps you’re already using e-cigs, but are not fully satisfied with your current brand. Well here’s your opportunity to try 10 different White Cloud flavors of your choosing in the Nicotine level that best suits your vaping habits. Want to try a better brand for less? For a limited time only, White Cloud is offering its Fling Mini Disposables 10-packs for the unheard of price of only $29.95. That’s only $2.95 each! Former pack-a-day-plus smokers will be please to know that White Cloud produces a “Double Extra” cartridge that is a full 5.4% Nicotine. That’s the highest level we know of and enough to sate the cravings of even the heaviest smoker. Click the photo above or the red text link below to save on your Flings today! Note that available Nicotine levels vary by flavor. Regular: Just like the fire toasted tobacco from the roaring 40’s. Menthol: A cooling menthe with a hint of Eucalyptus. Cin: The perfect balance of zingy sweetness and a hot burst of full flavor will satisfy your deepest nicotine cravings with every cinnamon puff. Vanilla: Skip the calories and have two scoops of this vanilla. Espresso: Never before has it been so easy to have a cigarette with your coffee. Strawberry: Just like a fresh picked strawberry. Kick: With subtle hint of honey and a full whack of cinnamon, Kick is sure to get you moving. Snap: Snap out of the sizzling summer heat with a refreshing melange of frosty mint leaves muddled with cacao beans. Lime & Coconut: Another outstanding flavored mixer that’s a perfect way to celebrate the summer! Bad Apple: We’re not talking about computers here, this apple is bad to the core, and by that we totally mean good. Peach Pit: Everything you love about a fresh Georgia peach without the fuzz. Banana: The fresh sweetness of ripe, yellow bananas offers an unmistakably creamy and tropical flavor. Bora Bora: Resembles a tropical blend of moist exotic tobacco with a hint of south pacific spice. Apache: Finally, a robust and distinctly American blend of rich, full bodied tobacco aromas and flavors. While these savings are great, they simply won’t last. This offer may expire at any time without prior notice, so get your Flings today! Enter WCKIT15 in the Coupon Code box at the checkout to receive a 15% discount on your White Cloud Starter Kit purchase. Click to save big on White Cloud Mini Fling Disposables! Apollo Memorial Day Coupon Code Sale! Posted by Admin on May 22, 2013 in e-Cigarette Coupon Codes, e-Cigarette Special Offers | Comments Off on Apollo Memorial Day Coupon Code Sale! Traditionally, Memorial Day signals the start of the summer season. At Apollo, Memorial Day signals better deals for you with coupon code deals worth up to 20% OFF. Celebrate the long weekend 20% OFF all Apollo E-liquids including their hot new summer flavors — Piña Colada and Berry Blend. 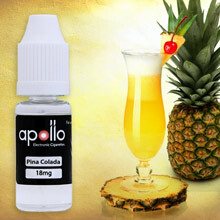 Apollo invites to take a trip to the Tropics with their new and delicious Piña Colada E-liquid. A perfect balance of pineapple and coconut, smooth, refreshing and alcohol free. Coconut and cream hits you at first taste, with plenty of citrus pineapple to finish out the vapor. It’s delicious with a cool and refreshing taste. Piña Colada also packs a punch on the throat hit. 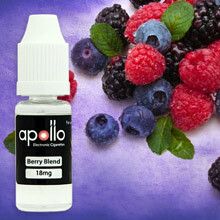 Apollo took everyone’s favorite summer berries to create this bright and fruity blend. It’s both sweet and juicy and tastes remarkably like a freshly made berry smoothie. Berry Blend is the perfect e-liquid for those hot summer days. All your favorite berries in a fruit forward blend. This combines the mellow sweetness of blueberry with the tang of raspberry and the juiciness of blackberry. Imagine a berry smoothie in vapor form. Sweet and delicious with a smooth and rich throat hit. Ecigs HQ wants you to know that there is nothing second rate about the Apollo brand of electronic cigarettes. In fact, we rate Apollo as the best e-cigarette of 2013. To get your 20% discount on any of Apollo’s fine e-liquids, simply click the banner at the top of this post, or click the red text link below and use coupon code “MEMORY”. But you’ll need to hurry as the sale ends on Monday, 5/27/13 at midnight. Click Now for 20% Savings on Apollo E-liquids! Posted by Admin on May 14, 2013 in e-Cigarette Special Offers | Comments Off on Fling A Friend Sale! Offer will expire without notice. Get 10 White Cloud Fling Disposables for only $29.95! Save Big on Flings! No Coupons Necessary! Save all Summer! With the lowest price we’ve ever offered on White Cloud’s wildly popular disposables, now is the perfect time to stock up for yourself, and all your friends who have been asking to try your e-cig! Want to try a better brand for less? Or better still — Fling a Friend with a gift they’ll remember. For a limited time only, White Cloud is offering its Fling Disposables 10-packs for the unheard of price of only $29.95. That’s only $2.95 each! Former pack-a-day-plus smokers will be please to know that White Cloud produces a “Double Extra” cartridge that is a full 5.4% Nicotine. That’s the highest level we know of and enough to sate the cravings of even the heaviest smoker. Click the banner above or the red text link below to save on your Flings today! Note that available Nicotine levels vary by flavor. Enjoy 20% OFF all White Cloud Fling Disposable 10-packs! Moscow Mule: The first Limited Edition Cartridge from White Cloud is a hip cocktail of chilled spirits with a ginger kick and a twist of lime. Diablo: Just when you thought summer couldn’t get any hotter, we’ve set it on fire. Save BIG on White Cloud Fling Disposables!